You can set up file actions for images that you are working on in Acorn. File actions will take your image out of Acorn and into another application. 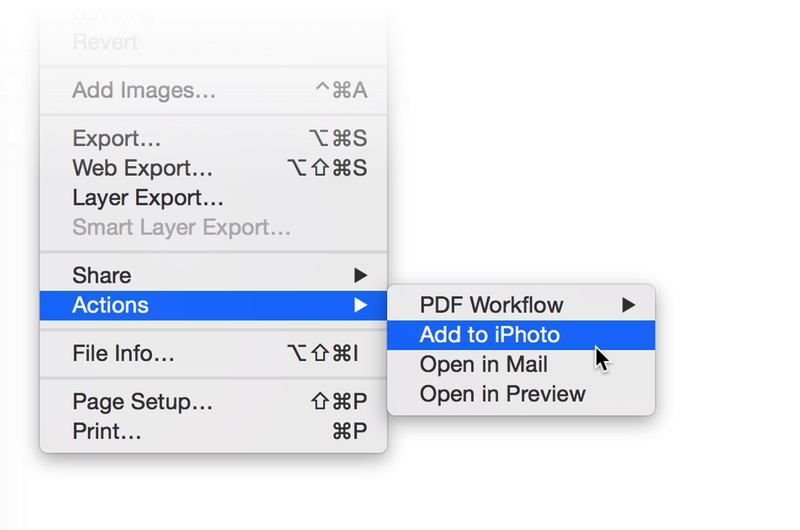 The actions that come pre-installed include PDF Workflow, Add to iPhoto, Open in Mail, and Open in Preview. To access this feature, navigate to File ▸ Actions. 2. Hold down the Option key while clicking on the 'Go' menu item. Choose 'Library'. 3. Navigate to the ~\Library\Application Support\Acorn\File Actions\ folder. From here you can duplicate the actions that are in there, edit them (open the action in an editor such as TextEdit), or move in pre-made actions. This tells Acorn to open the image in iPhoto. You may have noticed that you can drag images into the Dock and applications that have the ability to open them will respond by becoming highlighted. Any of those applications can be named in this script instead of iPhoto. Simply changing it to say "Safari" will open the image in Safari instead of iPhoto.